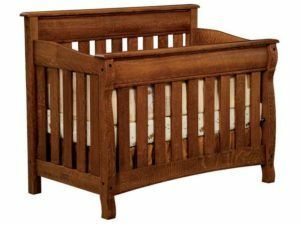 Presenting a superb collection of versatile, top-performing cribs, cradles and bassinets from Brandenberry Amish Furniture. Amish artisans build them all from solid hardwood. So they excel in strength and durability. Enough to rock your child’s world — and yours. Check ‘em out! A dynamic design accents the Castlebury Convertible Crib. 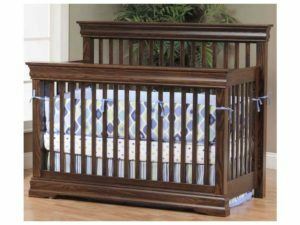 The beautiful Carlisle Convertible Crib boasts durable construction. 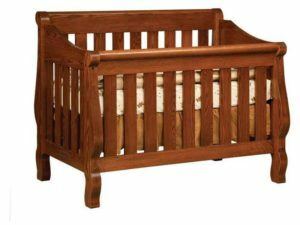 The Contempo Convertible Crib features a simple, modern style. Sturdy wood craftsmanship marks the Economy Convertible Crib. 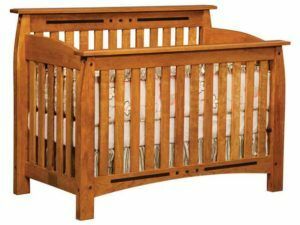 Arched panels accent the French Country Convertible Crib. 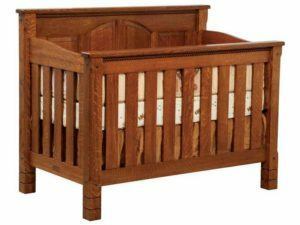 Curved legs accent the classic Hoosier Sleigh Convertible Crib. 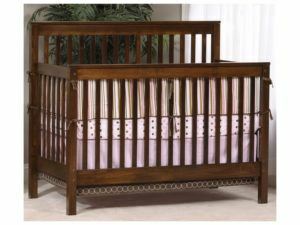 Beautiful wood inlays accent the Lindbergh Convertible Crib. A deep wood finish marks the Louis Phillippe Convertible Crib. 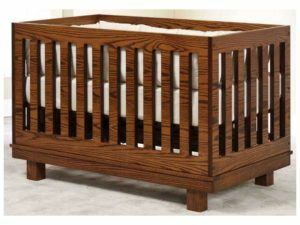 Beautiful wood slats highlight the Manhattan Collection Crib. 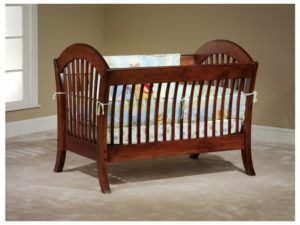 Sturdy wood slats and a rich wood finish mark the McCoy Convertible Crib. 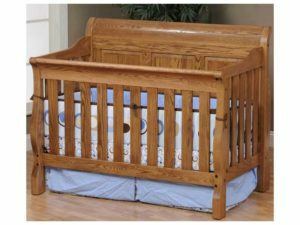 The classic Mission Convertible Crib possesses a timeless appeal. 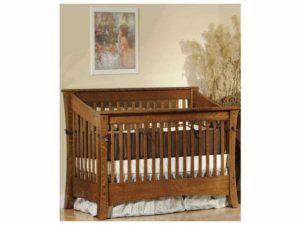 Beautiful wood construction and a classic mission style highlights the Mission Slat Crib. A sleek Mission design highlights the Monterey Convertible Crib. 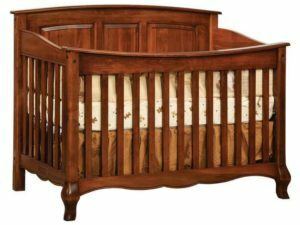 Delicate curved accent the Raised Panel Sleigh Crib. 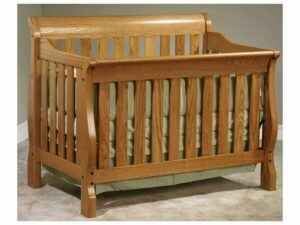 Graceful curves accent the Sleigh Convertible Crib. 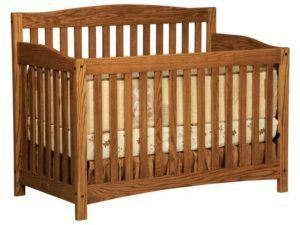 Arched panels and sturdy slats accent the West Lake Convertible Crib. 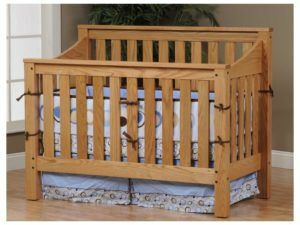 It is a crib that will certainly become a family heirloom with its capabilities to convert from a crib, to toddler bed and finally a full bed. 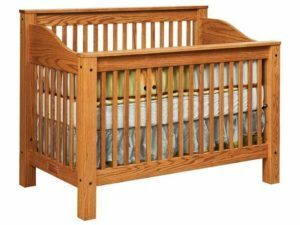 If you’re looking for solidly built, top-performing, and stunningly elegant baby cribs, cradles and bassinets, you’ve come to the right place. Because these pieces of bay crib furniture are from Brandenberry Amish Furniture. Strength and safety. Skilled Amish cabinetmakers custom-build each piece. And they use solid hardwoods. Like oak, maple, cherry an hickory. Plus, the builders utilize quality cabinetmaking devices like mortis and tenon joints. What’s more, each crib undergoes rigid testing and fully meets federal standards. So you can rest assured your child is sleeping in a safe crib. Infancy to adulthood bed. Our convertible cribs grow with your child from infancy to adulthood. So you can make one bed purchase. And your child will have a bed for every stage of life through adulthood. Keep newborns by your side. Our cradles and bassinettes are perfect choices for your newborn baby. The units come standard with pads for your baby’s comfort. So they are the perfect choices when you want to keep your baby close by your side. Fully customizable. You can customize each crib, bassinet and cradle, so it’s exactly the way you like it. For starter, you can choose the wood species, finish, Plus, you can select features like hardware and finished size. Or any other feature that meets your fantasy.